Oh POSTPARTUM how I love to hate you! It's like I longed for this dreaded nine months to be over, and even though I have done this whole pregnancy thing before, I still thought oh I will go to the hospital, have these babies, and BAM I'll be back to normal...NOT!!!! It's almost like your worse when you leave then when you came in...especially after a C-section! Never the less, a few weeks go by and I think for sure I can slip into my pants...WRONG AGAIN! Multiple times since I have had the twins I have thought this is the day that I will be able to put my pants on. They will button up, I will look normal, and I will still be able to breathe! News flash it still hasn't happened! With that said, Kenzi and I both have about 2-3 pairs of pants that we keep at the back of our closets, for this exact reason. They are a size or two bigger than what we normally wear, this way we are able to wear them right after pregnancy while our body is still in "transition phase." Some of you may say, why not continue to wear your maternity clothes, well if you are anything like us we can't stand the sight of our maternity clothes one more day after we deliver! These few pairs of pants get you through these special weeks of "POSTPARTUM!" I also like to go shopping prior to delivering and buying a few "transitional pieces," these will also help you get through these special weeks when you may not be particularly be feeling your most confident. 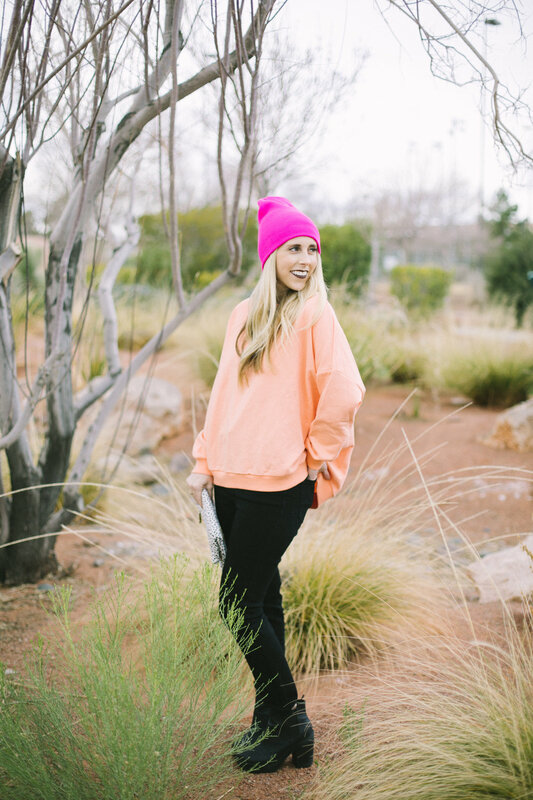 Like this oversized sweatshirt, I should have bought it in every color! Another good one is a flowy top or longer top that you can wear with leggings or your "transitional pants." :) If your lucky enough to deliver during colder weather another great item is a long cardigan or sweater. Let's be honest the only thing good about postpartum, and perhaps the only reason we do it, is being able to look at that sweet baby everyday. Let me tell you something else, I have enjoyed it so much more the second (and third) time around. Being a mom is the best thing ever, what we have to do to get here though is not my favorite, but those little munchkins are totally worth my stretched out jiggly belly pooch! It just means I have an excuse to add a few pieces to my wardrobe that might hide it!